With the release of the second Hobbit film, we are now just one film away from director Peter Jackson bringing the entire, epic LORD OF THE RINGS saga, which includes THE HOBBIT, and parts of the SILMARRILLION to the big screen. And with this second installment of The Hobbit, Peter Jackson finally recreated the magic that made the first trilogy so memorable. THE DESOLATION OF SMAUG feels more focused, personal, and moves the plot along rather than AN UNEXPECTED JOURNEY, which suffered from exposition-overload and an overabundance of walking. The story picks up right with our band of heroes running from the Orcs that were chasing them last movie. The plot doesn't take the time to recount what's happened in the first film, and assumes, as it rightfully should, that the audience has knows what has happened. As our group draws closer to the Lonely Mountain where Smaug (played by the sassy Cumberbatch) protects his treasure, more action happens, there's less mindless talking, and formerly forgettable are now better developed. Even though the dwarves were only distinguishable by their physical characteristics in the first film, most of them get fuller character arcs, thus giving weight when any of them are in mortal danger. The action sequences are even longer and more complex. There's a standout section where our heroes are being chased down a roaring rapids in barrels that gets more extreme and almost comical as it progresses. At one point, there's something that is so outlandish that happens, it almost takes you out of the film. However, it's easily forgivable given how much fun the sequence ends up being. There are many new parts of Middle Earth we're introduced to, but never once do any of sequences feel convoluted or confusing.With each subsequent set piece becoming bigger and more complex, the film does a remarkable job making sure the audience knows the space where the action is taking place. I saw this film in 2D, so I cannot comment on how well the 3D worked or how the high frame rate looked. However, there was never an instant where I wished I was watching the film in 3D. The story begins to suffer a little when our main group gets split up. In the final third of the film, there ends up being three simultaneous storylines about various characters who have been separated from the main group. Even though each storyline is important, cutting between all them makes the film feel disjointed as compared to the earlier parts. 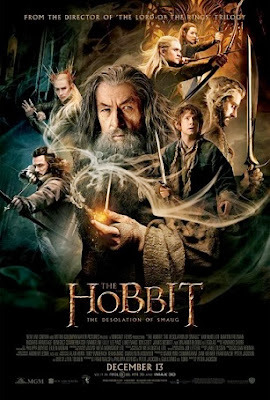 Bilbo (the always fantastic and amiable Freeman) takes a bit of a back seat in this film, though he still gets the best scene, with the focus steering more towards Thorin (Armitage) and some of his companions. Even though he's the cause of this adventure, Thorin has never felt fully developed. His reasons for wanting to reclaim his homeland is understandable, but the script hasn't let him become as sympathetic as he needs to be. It wasn't a surprise that the first film ended up being more of a set up for the second and third films. DESOLATION has more of the charm and pacing that made the LOTR films so watchable and loved. Even with a running time close to three hours, the film never fell into a stalemate. And the filmmakers couldn't have picked a better beat to end the film and keep us anxious for THE HOBBIT: THERE AND BACK AGAIN.